One of these variable length records is kept for each selector containing more than one keyword. 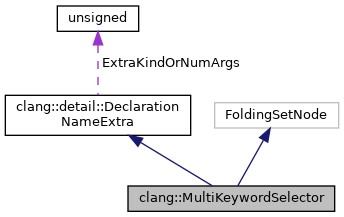 We use a folding set to unique aggregate names (keyword selectors in ObjC parlance). Access to this class is provided strictly through Selector. Definition at line 364 of file IdentifierTable.cpp. Definition at line 386 of file IdentifierTable.cpp. Definition at line 371 of file IdentifierTable.cpp. Definition at line 396 of file IdentifierTable.cpp. Definition at line 442 of file IdentifierTable.cpp. Definition at line 388 of file IdentifierTable.cpp. Definition at line 392 of file IdentifierTable.cpp. Definition at line 401 of file IdentifierTable.cpp. Definition at line 408 of file IdentifierTable.cpp.